North Korean dictator Kim Jong-un reportedly presented senior officials of his regime with copies of Adolf Hitler’s anti-Semitic ‘Mein Kampf’ and recommended it as a source of inspiration. Citing a Chinese source, the ‘New Focus International’ website reports that on Kim’s birthday in January, officials ranked departmental director and above in the National Defense Committee were presented with a translated edition of Hitler’s book, which is officially banned in the reclusive Stalinist country. During the rule of Kim Jong-un’s father, Kim Jong-il, North Korean officials received holiday gifts of western liquor, tailoring fabric and other foreign luxury goods. Since Kim Jong-un came to power, however, the leader’s customary holiday gifts have been very different, including items such as imported sports equipment, CDs and foreign books in translation. "Kim Jong-un gave a lecture to high-ranking officials, stressing that we must pursue the policy of Byungjin (Korean for ‘in tandem’) in terms of nuclear and economic development. Mentioning that Hitler managed to rebuild Germany in a short time following its defeat in World War I, Kim Jong-un issued an order for the Third Reich to be studied in depth and asked that practical applications be drawn from it,” the source told ‘New Focus’ in an interview. He added that Kim Jong-un had highlighted sport as the secret behind Germany’s unity and ideological successes. Kim also stressed the superiority of Hitler’s thinking in childhood-related policies, and issued an order for propaganda departments to encourage a “Three Child” policy. It is likely that the gift was meant to urge officials to think about how an isolated and weakened Germany had managed to build a powerful economy and military in the 1930s. Rumors have been spreading among the Pyongyang elite that Kim made a close study of Hitler while at school in Switzerland, according to a North Korean source, according to an unnamed business representative and a frequent traveler between Pyongyang and China quoted by the online magazine which specializes on analysis of developments in North Korea. It also reports that the director of North Korea’s secret police made a speech at a gathering in which he referred to the Gestapo, the Nazis secret police: “We are equivalent to a police force. In other countries, people fear the police more than they fear the army. Stop focusing on ways to make money in the markets, and mold yourselves after the Gestapo. 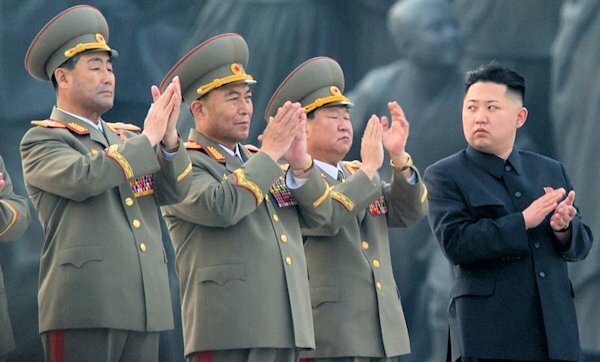 In the Kim Jong-un era, the Department of People’s Security is the most powerful department – be proud,” he was quoted as saying.